Stainless steel cafe rear fender to fit the SR500 & SR400. Stainless steel (304) medium length cafe rear fender to fit the Yamaha SR500 & SR400. 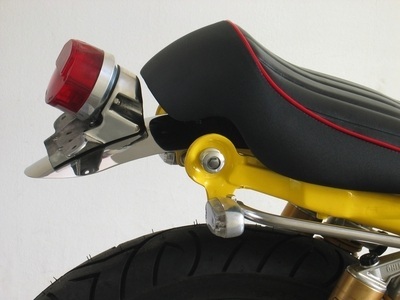 This premium quality highly polished cafe rear fender gives a classic retro cafe racer look. Overall length 820mm (measured on the arc). Length from rear bracket to tail end 210mm. Width 120mm. Heavy stainless steel bracketry is secured with stainless steel button head allen screws. 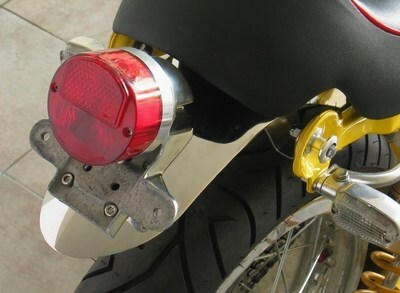 Taillight mounting holes are 48mm on center.